In competitive global scenario banks are very keen in branding their corporate social responsibility to enhance their service performance to compete effectively. This study was carried out to explore and assess the impact of corporate social responsibility on service performance in banking sector through reputation. To measure the corporate social responsibility, Maignan and Ferrell (2004) CSR scale, for the service performance the SERVPERF Model Parasoarman (1985), and for brand equity the brand equity (BI) index, developed by Aaker (1991) were used. The simple random sampling technique was used to collect the data from 617 banking customers. Structural Equation Modelling was used to measure the impact of corporate social responsibility on service performance through brand equity. The findings of the study indicates that CSR initiatives were linked to stronger service performance of the bank which ends stronger brand performance with the bank. Aishath Nareeman, Zubair Hassan (2013) in their research they examine the impact of perceived corporate social responsibility (CSR) practices or initiatives on customer satisfaction and loyalty. A conceptual framework comprises of four elements (economic, legal, ethical and philanthropy) developed by Carroll (1991) was used to examine the CSR practices and its impact on customer satisfaction and loyalty. A multivariate likert-scale questionnaire (scale from 1-6) has been developed with one additional dimension (customer satisfaction) and its impact on loyalty. A sample of 152 respondents has been used to collect the data using convenience-sampling method. The results shows that there is a significant and positive impact of CSR dimensions of economic, ethical, and philanthropy on both customer satisfaction and loyalty. The result shows a negative relationship between legal CSR dimensions and customer satisfaction and loyalty. This result is confirmed by correlation analysis as well, which is run on both full version and modified version of dataset generated after exploratory factory analysis. In addition, this research found that there is significant and strong positive relationship between improved customer satisfaction and loyalty. This study concluded that increasing perceived CSR practices such as economic, ethical and philanthropy CSR would improve both customer satisfaction and loyalty. 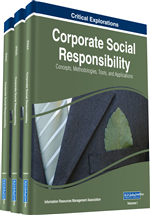 Therefore, manager at corporate sector should take initiatives to increase perceived CSR practices to improve customer satisfaction in order to retain and build loyalty of customer.